Never Enough Nails: Swatches of 2 New Sally Hansen Secret Garden Miracle Gel Shades! Swatches of 2 New Sally Hansen Secret Garden Miracle Gel Shades! Although I'm knee-deep in swatching fall collections, I still have a few summer goodies left to show you! The weather here is distinctly summer-y, so I'm not feeling fall stuff yet anyway. Today I have two new shades from the Sally Hansen Miracle Gel Secret Garden collection for summer. First up is Sally Hansen Freesia Your Mind, a bright fuchsia pink creme. 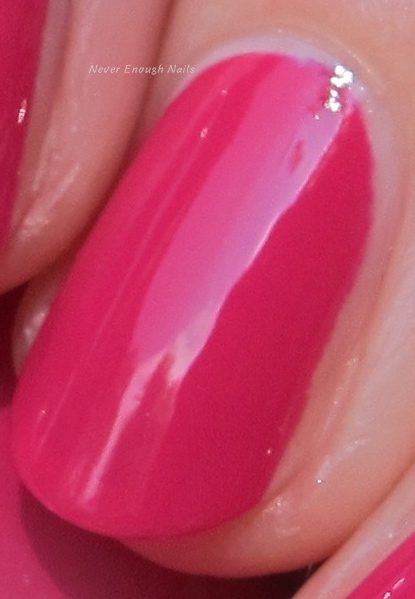 This is a great pink with berry/blue undertones and it looks fantastic with all the shine the Miracle Gel top coat adds. This is two super easy coats. I do love the Miracle Gel formula. It has that gel-like consistency that makes the polish really stay right where you apply it. The larger, oval-tipped brush allows for a nice shape by the cuticles, so I barely need any clean-up. I finished this off with one layer of the Miracle Gel top coat. This is a perfect end of summer shade while the weather is still steamy! Sally Hansen Ba-Bloom is a hot orange coral with plentiful golden shimmer. This one has a touch more pink/peach in person, but it is more of an orange coral for sure. The shimmer is so beautiful in the sunshine! This is two coats as well and the application was also excellent. I used one layer of Miracle Gel Top Coat here too. Both of these shades are limited edition and are available at a drugstore near you!